Does anyone have wood ceilings that are varnished? I'm installing the ceiling and I used 6" t&g. I was going to paint it white like some cool pictures i've seen but after I put about half of it up I think it would look better with a light stain and varnish. Do any of ya'll have a wood ceiling that is not white? Most of the pictures I could find are all white. I'll post some pictures when I go down there this morning. I was going to paint, but chose to use a satin finish on the wood. My ceiling is 6" V groove....pine. My only regret is at night the reflection off of the ceiling kills vision out of front wheel house windows. A black panel or fabric on Velcro above the wheel house windows would do the trick. Off shore it's really not an issue, but coastal it is. The photo is of a boat overhead. A boat ceiling is against the side of the hull. Varnish would look fine and it can always be painted. 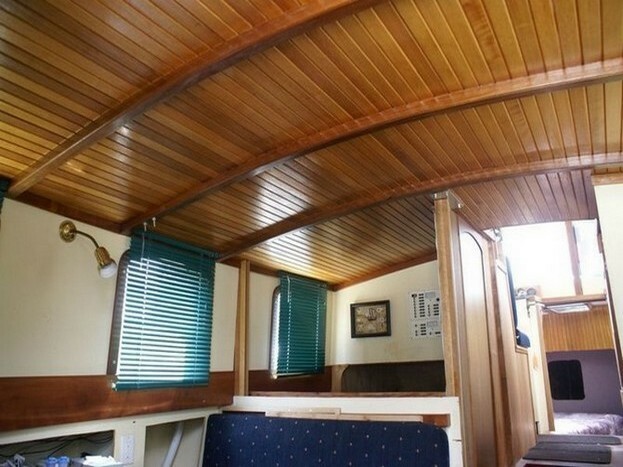 The free boat I picked up came with varnished wood ceilings. IMO it's to much wood and darkens the interior to much. Making the large saloon feel smaller than it really is. But please tell me that's not a dry chemical fire extinguisher next to the fire place? Here is a picture of out last sailboat, an Able Whistler 32 that had varvished ceilings and a painted overhead. None of these were tongue and groove but rather simple boards that were fastened to plywood strips glassed to the hull. Anytime I had a leak of any kind, the painted overhead had to come down and be repainted...I worked hard on eliminating leaks! Other than the issues of light reflection as was mentioned, I would go with a white painted overhead to make the interior brighter. Unfortunately, it is a dry chemical, that's what the boat came with. It has been relocated. The plan is to relocate it (them) off the boat and replace with CO2. My CHB has dark narrow planking on the overhead. It is dark but not too bad during the day. But it does make it seem small and constricted. I have contemplated doing a swath of white maybe 5' wide down the middle to brighten things up but have not yet done so, sorry no pics of it. Mr. and Mrs. Boatpoker have a really lovely varnished wood overhead aboard Dirt Free. One of my favorite parts of the boat, actually. Really makes the cabin feel warm and cozy. Except for the mess, a dry chemical works as well or better than co2. I had a fire on a wood boat in an enclosed space below the stack caused by an insulation failure. I didn't catch it until the flames were 3' high. The chemical smothered it immediately. I did have to wet down the wood. Cajun Rose might be the exception to a white ceiling, the timber looks too good to paint. Having done some overhead varnishing, I suggest light brush loadings, and long gloves. Hey Paul , looking good . Is that cypress or pine ? Just a thought if you do decide to stain and varnish I would use something like min wax pre stain first . It will help with with the way different grains take the stain . The color will look more consistent . Our choice was to use 21/4 inch wide mahogany ply battens on the beams for the nautical look. and visible from the interior noise absorbing white planks . A hard overhead will reflect noise , not my first choice. It's pine, The way the boat was built there are sections between the "overhead" supports (thank FF for teaching me something new). The bedrooms are done and from the supports (doubled up 2x4's) out to the windows are done. The center is a long unubrstructed run from the front to back, I am going to buy some new long lengths for that and probably go with the light stain. 90% of everyone who looks at it either wants to leave it natural or a light stain.